What does Ron Paul have to say about the stock market bubble? Former congressman Dr. Ron Paul says we are in the midst of “the biggest bubble in the history of mankind” and a correction in inevitable. In fact, Paul has said that a 50 percent stock market sell-off should not be a surprise. 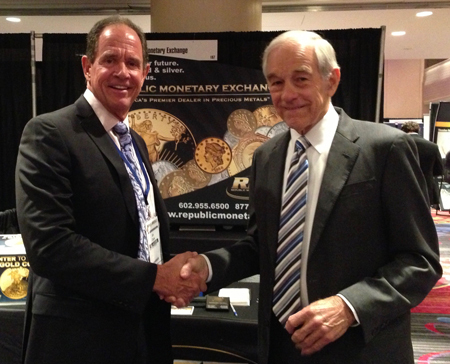 Those of us concerned about debts and deficits, about honest money and Fed money printing know to listen when Ron Paul speaks. His remarks in Congress about the housing bubble in its building stages proved to be like a play-by-play description of the tragic events that eventually played out. “Republicans and Democrats are alike, they don’t concern themselves about deficits. The only thing that they can do is print money and spend money and teach everybody to ignore the deficits,” he said. “We’re getting awfully close. I’d be surprised if you don’t have everybody agreeing with what I’m saying next year some time,” said Paul. Dr Paul is also warning of a likely surge in oil prices to over $100 a barrel. Oil has been climbing more or less continuously since early in 2016. Prices have almost tripled since then. Remember that spiking oil prices in 2008 were a prelude to the stock market calamity that unfolded later that year. Like higher interest rates, rising oil prices are like a tax, a depressant on the economy, on corporate profits, and on stock prices. What can informed people do to protect themselves from a brutal stock market correction? We recommend our clients buy gold.